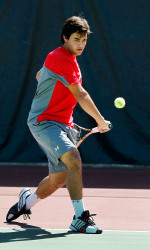 SALT LAKE CITY – The University of Utah men’s tennis team (3-0) captured its first 7-0 shutout of the season against Montana Saturday at the Eccles Tennis Center. Junior Alejandro Medinilla posted the match clincher at the No. 3 singles position. The Utes won their first doubles point of the year and continued their strong play in singles, not dropping a single set. Catch the Utes back in action Friday February 1 at 5pm against Air Force at the Eccles Tennis Center. This entry was posted in Schedule/Results and tagged Alejandro Medinilla, Ben Tasevac, Cedric Willems, Devin Lane, Dmytro Mamedov, FD Robbins, Garrett LaBarre, Rafael Davidian, tennis, University of Utah, Utah Utes. Bookmark the permalink.